What is the GASTROS Study? GASTROS is an abbreviation of GAstric cancer Surgery Trials Reported Outcomes Standardisation. The study aims to standardise the way outcomes are reported in research trials examining surgical treatments for gastric cancer. GASTROS is fully funded by the National Institute for Health Research (NIHR) and is supported by the Medical Research Council’s (MRC) Hubs for Trial Methodology and Research. Ensuring that different trials report their outcomes in the same way enables researchers, doctors and patients to compare the effects of different treatments with greater ease and accuracy. This is especially important for gastric cancer where the long term survival rate is poor and the need to improve current and future treatments is especially urgent. Surgery is the mainstay of treatment for gastric cancer, yet there remain many unanswered questions regarding the best surgical techniques to use. We believe, therefore, that standardising the reporting of outcomes in these studies is the first step to improving outcomes for patients with gastric cancer. We also know from initiatives to standardise the reporting of outcomes in other fields, that patients can have significantly different opinions as to which outcomes are important to them when compared to doctors. In response to this, the GASTROS study has been designed to ensure that patients’ opinions are central to the process so that the final result reflects the views of both patients and doctors. How do we aim to achieve our goal? Over the next five years, GASTROS aims to gain consensus from surgeons, nurses and patients to decide what are the most relevant outcomes that surgical trials should report. This is called a Core Outcome Set. In addition, GASTROS will identify the most appropriate tools (know as outcome measurement instruments) to measure these outcomes. We will ensure that our work is publicised widely so it can be implemented in future trials. How will we develop a Core Outcome Set for Gastric Cancer Trials? Below is an illustrated overview of the process which will be followed. Broadly speaking, there are three stages involved (described below); we are currently at ‘Stage 2’. Stage 1: Identifying potential outcomes. The first stage of our work involves identifying which outcomes surgical research trials have previously reported. This will be achieved by undertaking a systematic review of scientific journals. We will also be carrying out interviews with gastric cancer survivors to identify any further outcomes which patients believe are important. The results from the systematic review and interviews will be combined to formulate a long-list of potential outcomes to include in stage 2. Stage 2: Determining core outcomes. 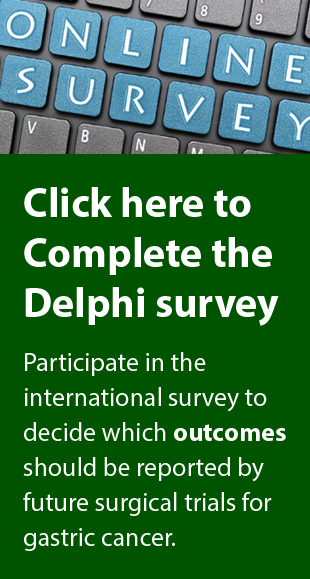 The long-list of potential outcomes from stage 1 will be placed through 2 rounds of a Delphi survey. The most important outcomes to surgeons, nurses and patients will be presented to a consensus meeting involving doctors, nurses and patients to finalise the core outcome set. Stage 3: Determining how the core outcomes should be measured. 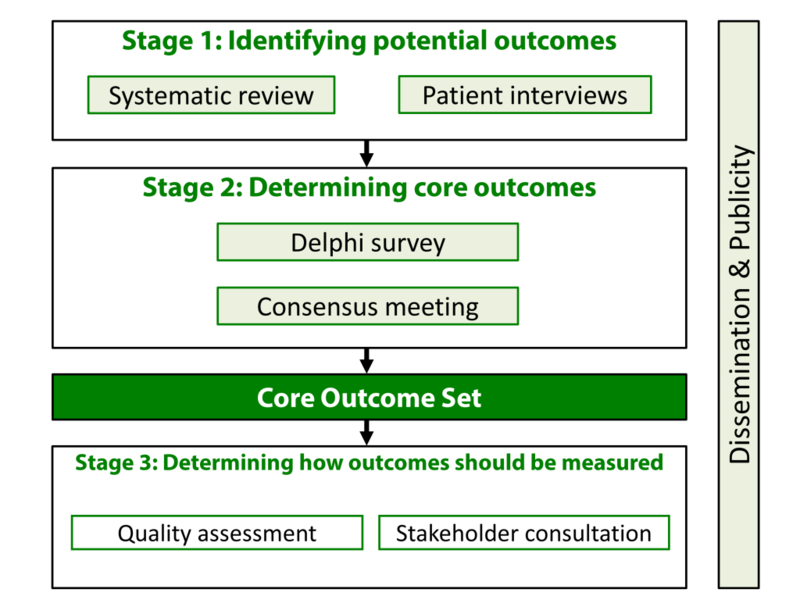 Once the Core Outcome Set has been derived, it is important to be able to inform researchers how best to measure these outcomes. Stage three will identify the best measurement instruments through consultation with patients and clinicians. If you would like any further information about our work, please do not hesitate to contact us here. Why do we need a core outcome set for surgical trials in gastric cancer? How do we develop a core outcome set?